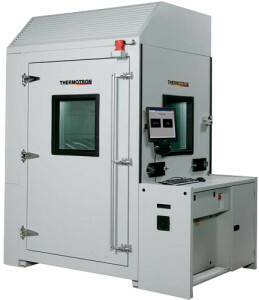 Thermotron is the only company in the world that has constantly innovated and advanced HALT/ HASS testing technology. Thermotron is dedicated to new Accelerated Stress Testing technology, it continues to work with industry leaders, HALT /HASS experts, testing experts for designing systems in sync with the market requirements. Why buy Thermotron AST Series HALT /HASS Chambers and what is so unique of those? High Frequency: 100+ Grms levels, decreasing the time to find product failures. Unlike other systems that generate spike at 1g or low, AST series can simulate precise low g levels without spike. Multi-Zone Control: Multi-Zone Vibration Control is the first of its kind. Users can choose from one, two, or four table zones and test different-sized products at the same Grms level and stress same-sized products at different Grms levels. AST Control system: The AST-8800 control system features a Windows®-based graphical user interface. The controller can be configured to monitor run-time on wear items and automatically alert the operator when periodic maintenance is required. Multiple Sizes to Suit your Needs: AST standards series are available in 8, 18, 35 & 70 with variety of table sizes that would meet most of your HALT /HASS testing needs. Multi-Zone Vibration Control is the first of its kind. Users can choose from one, two, or four table zones and test different-sized products at the same Grms level and stress same-sized products at different Grms levels. The AST-8800 control system features a Windows®-based graphical user interface. The controller can be configured to monitor run-time on wear items and automatically alert the operator when periodic maintenance is required. AST standards series are available in 8, 18, 35 & 70 with variety of table sizes that would meet most of your HALT /HASS testing needs.